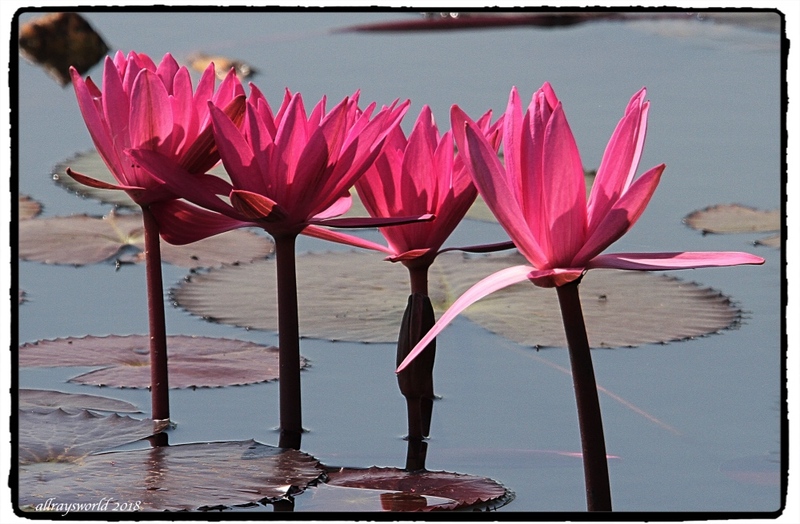 I spend quite a lot of time gazing at the lovely Lotus blossoms that thrive in lakes and puddles all around me. Ray: I had to get a shot of that line of beauties, Larry. Beautiful photos of these amazing, hot pink blossoms! Ray: They are lovely, Elizabeth, and grow everywhere there is a bit of water. Ray: vous êtes très gentil, Martine. Difficile de ne pas les admirer , c'est si beau un lotus . Ray: Je les trouve irrésistibles, Claudine. Well I certainly can't criticise you for doing this blameless thing Ray. Aren't they gorgeous! Ray: They are lovely things, Chris. wonder- wonderful blossoms and images! Ray: The blossoms are exquisite, Philine. I'm not surprised; they are so beautiful. In the second image; you need to clone one out as three makes for an even better photo than four. Ray: Removing one would be an un-natural act, Alan...that would have got me jail-time not many years ago! Ray: They are as you say, Bill...even when there are four of them. I'm not surprised Ray, they are beautiful. Ray: One of the most attractive of plants, for sure, Brian. Ray: Many of the local villagers see these plants purely as food, Tom.